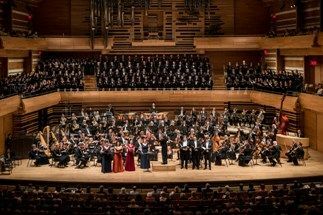 The Orchestre symphonique de Montréal (OSM) opened its 84th season with an uninspiring performance of Mahler’s Eighth Symphony. The last time the OSM performed it was in 2008, in Place des Arts’ cavernous Salle Wilfrid-Pelletier whose acoustics are less than ideal. Expectations were high, therefore, for the first performances in their new home – the Maison symphonique – which now features excellent acoustics. OSM Music Director Kent Nagano engaged about 300 musicians, filling the stage, choir loft and third-tier side loges. In Munich, Mahler enlisted over a thousand in the 1910 premiere, allowing its promoter to dub the work Symphony of a Thousand. It is generally considered the high point of Mahler’s career. The OSM’s rendition on Thursday, however, failed to invoke the radiance and splendour of this glorious composition. The climaxes were appropriately climactic but the sound opaque and muddy, even more so in the loud passages of “Veni, creator Spiritus”; the quieter, slower passages were – well, quiet. But the overall performance lacked heart. The blame can be laid squarely at the feet of Mr. Nagano. While maintaining a brisk pace he didn’t sustain the tension and diaphanous rhythm crucial to the symphony’s momentum. For the most part, he failed to inspire and instil confidence in the orchestra’s musicians. This is an ensemble that rarely takes risks under Nagano. It’s as if the players were holding back, afraid of making mistakes. They don’t seem to enjoy themselves. Apart from some felicitous playing from the woodwinds and a few shimmering passages from the upper strings (including delightful solos from concertmaster Andrew Wan), there was little to provoke excitement or wonder. All too often, the augmented horn section didn’t glow, the harps failed to shimmer, the trumpets sounded shrill, the timpani lacked warmth and the lower strings (including the world’s only operating octobass) didn’t resonate. The choruses and the female solo singers fared better. The OSM Chorus, under the direction of Andrew Megill, sang with taste, impeccable articulation and attention to detail. The children’s chorus – Les Petits chanteurs du Mont-Royal – prepared by chorus master Andrew Gray, radiated. The dazzling British-German soprano Sarah Wegener stole the show, expressively thrusting herself forward, flipping rather than gently turning the pages of her libretto, and singing with assurance and abandon that she maintained almost to the end. On the final notes, however, she and soprano Camilla Tilling closed by singing in a hushed mezzo forte rather than triple forte as indicated in the score. Quebec’s Marie-Nicole Lemieux, at the pinnacle of her career, sang with lush, soaring sound. Aline Kutan delivered an ethereal Mater Gloriosa from high in the organ loft. Mezzo-soprano Allyson McHardy sang with eloquence and vocal color. The male soloists were hardly adequate. Tenor Michael Schade’s abrasive voice could barely be heard above the full orchestra, bass David Steffens lowest notes tended to fade out and a struggling baritone Russell Braun as Pater Ecstaticus sounded anything but ecstatic. The extra brass choirs played from the third-tier loges. Nagano terminates his tenure at the OSM with the 2019-20 season.